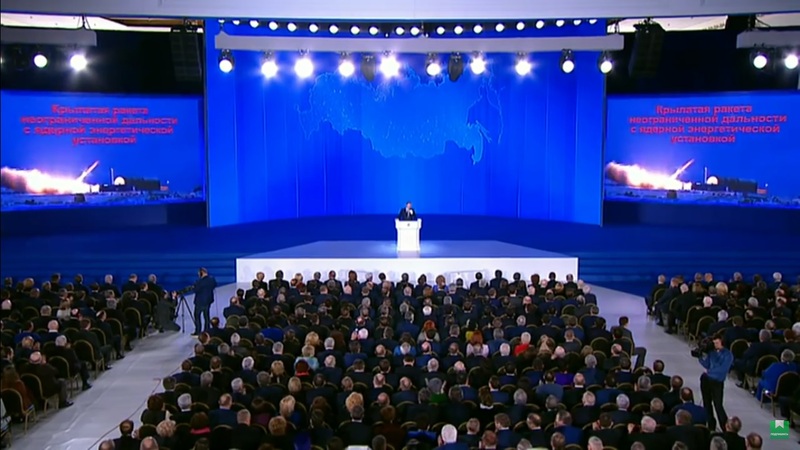 Vladimir Putin’s address yesterday was primarily directed at his domestic audience which wouldn’t have believed him if he promised improvements at home but could be kept drugged with a surrogate for imperial triumphs by his suggestion that Russia has weapons that mean America is “already ours,” Vladimir Pastukhov says. But unfortunately for him, the Kremlin leader isn’t able to keep his remarks away from those beyond Russia’s borders, the UK-based Russian historian says; and they will read Putin’s threatening tone not as a reflection of Russia’s real power, which is much less than the West’s, but as a reason to extend their advantage. Because that is so, Pastukhov says, Putin won’t get what he wants and virtually promises his electorate, “a new Yalta” in which the West will divide things up with a revived Russia, but a new version of Ronald Reagan’s Star Wars, which Moscow wasn’t and again isn’t in a position to counter. The Kremlin leader certainly achieved his goal with the Russian people providing them with a “surrogate” for the narcotic of real imperial conquests like the Crimean Anschluss. To judge by his words, the historian says, “America is already ours” because Russia has weapons which no one else has and against which no one can defend. Thus, Pastukhov continues, if one accepts Putin’s logic, Russia “has the right to dictate its will to even the most powerful state in the world; and if it doesn’t do so, then this is only the result of its innate peace-loving quality.” That is not the kind of language he is likely to use with Trump or other Western leaders, however. They have their own sources of information. “Considering that the total financial, economic, technological and beyond doubt military might of the West exceeds the Russian potential many times over, Putin could get instead of ‘a new Yalta’ a new ‘Star Wars’” and the second edition of that could have results very much like the first. Again, it will be difficult for Moscow to keep up, and it may soon be the case that Putin will wish that he could call back his words. Is Russia getting ready to launch a nuclear strike from Crimea?